We keep a few of these girls in the backyard for some good old-fashioned duck entertainment and a steady egg supply. They are friendly and sociable ducks who do admittedly make a ton of noise, so they might not be the best duck of choice if you live in an urban area and/or you are keeping ducks against municipal regulations. Expect a round of synchronized clucking from these "guard ducks" when the mailman arrives each day! They seem to get each other worked up pretty easily so if one starts carrying on about something all the rest are likely to join in. I do enjoy chickens as well, but in my opinion ducks are infinitely better--more trainable, friendlier, more productive, and the eggs are far tastier and more nutritious. In general ducks are also more winter-ready if you live in a place that sees cold temperatures for part of the year. Chickens are far more delicate in that regard, but the ducks will happily play in the snow and have a grand old time. Their laying productivity does decline with less daylight, so don't expect the same explosive egg supply you get in the summer in the winter. The Khaki Campbell is a good "starter" duck, especially if you get them early enough to socialize them to you. They're not going to be quite as loyal and devoted as the family dog, but they do get excited to see you and come up and eat out of your hand if they're used to you and trust you. Plus they're just ridiculously cute. Some other things to be aware of: they poop all day every day, and you'll need to stay on top of that if you don't want them living (and laying eggs that you want to eat) in mountains of their own filth. This primarily applies to their water supply, which is important to keep clean and fresh and available to them so they can keep themselves clean. We had a cold snap last winter and their tub froze over, and some of the girls had a lot of trouble keeping their feathers properly oiled, which is their protection against the cold. 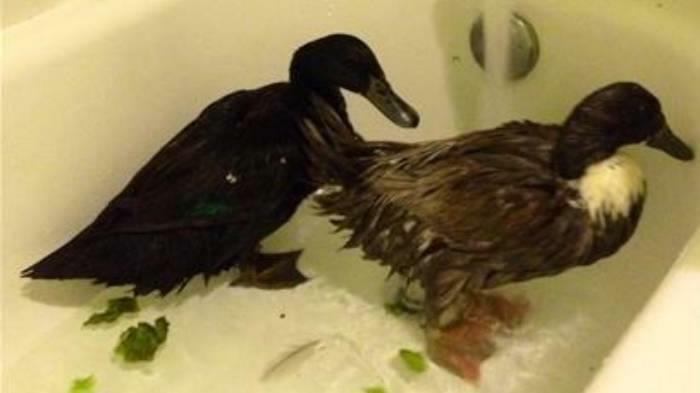 So we brought them in for bath time in the house along with some of their other duck friends from the neighbors. This too, could be your experience. Living the dream right here, folks.